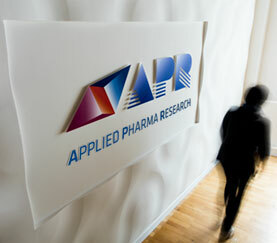 APR Applied Pharma Research s.a. informs that the following pages are reserved to Health Care Professional (HCP) in EU. 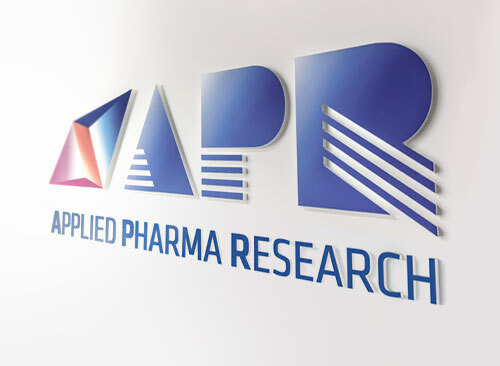 In no event APR Applied Pharma Research s.a. and its affiliates companies shall be liable for any use or exploitation of the information contained in the following pages if not previously authorized in writing by APR Applied Pharma Research s.a.
By clicking on the following link you declare under your own responsibility to be an HCP in EU and to accept the conditions here above described. 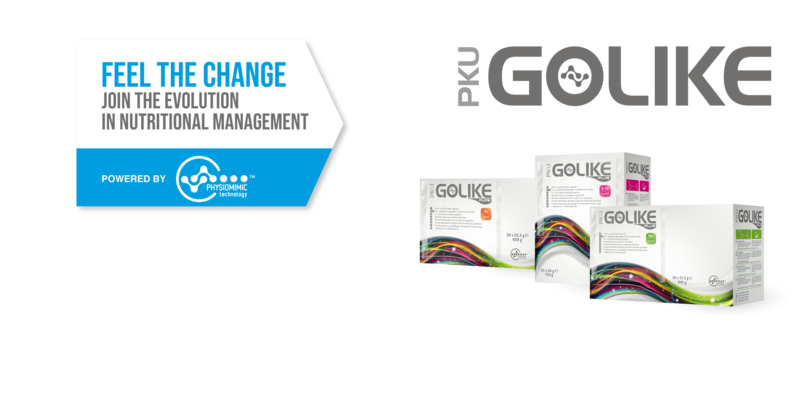 PKU GOLIKE is a brand-new food for special medical purposes (FSMP) for a real change in Phenylketonuria (PKU) dietary management. 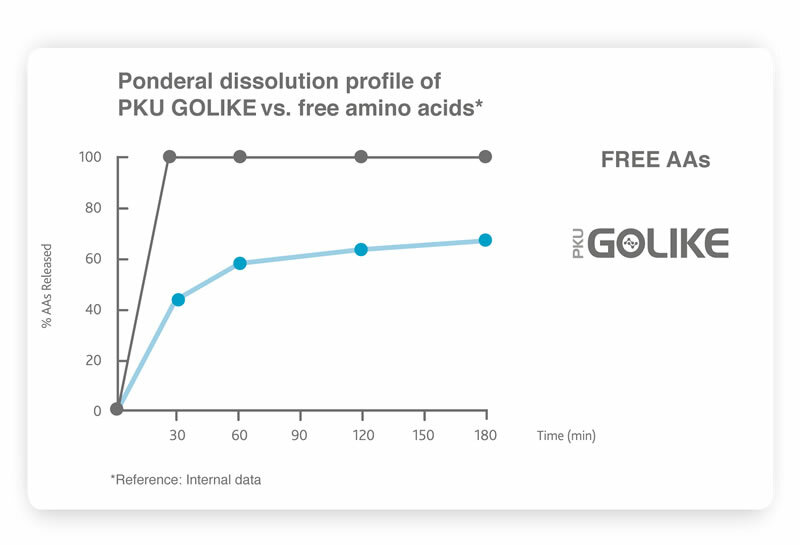 PKU GOLIKE is the first Phe-free Amino Acid (AA) mix providing physiological absorption of amino acids while masking unpleasant taste and odour as well as preventing aftertaste. PKU GOLIKE range is made of three AAs formulations in micro granules accurately studied for an optimal nutritional management from 3 years of age onwards. - PKU GOLIKE PLUS 3-16 & PKU GOLIKE PLUS 16+ with amino acids, vitamins & minerals. 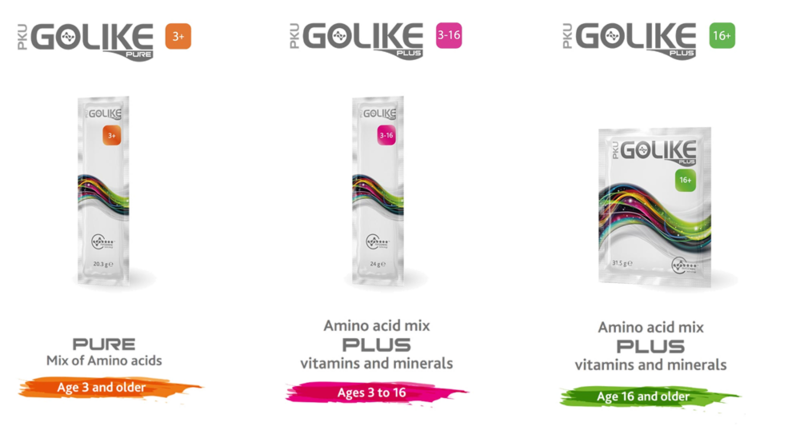 - PKU GOLIKE PURE 3+ with only amino acids. PKU GOLIKE is featured by its flexibility in the mode of use. It can be used with different types of allowed food and drinks according to patients' taste and crave, either at main meals and or snacks. Creamy foods are recommended for best texture. It can be mixed it with both cold and warm (not hot) liquids or foods. Dishes and drinks should be consumed shortly after preparation with PKU GOLIKE. 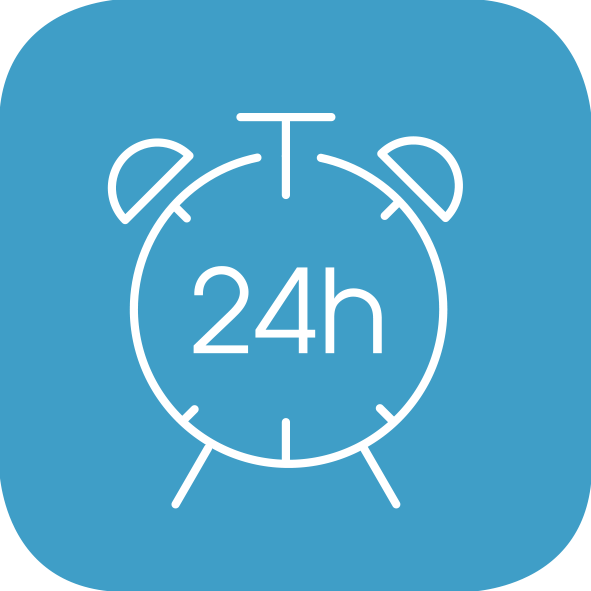 The content of a sachet can be used for different preparations within 24 hours after opening. (*) PKU GOLIKE must be used under medical supervision. 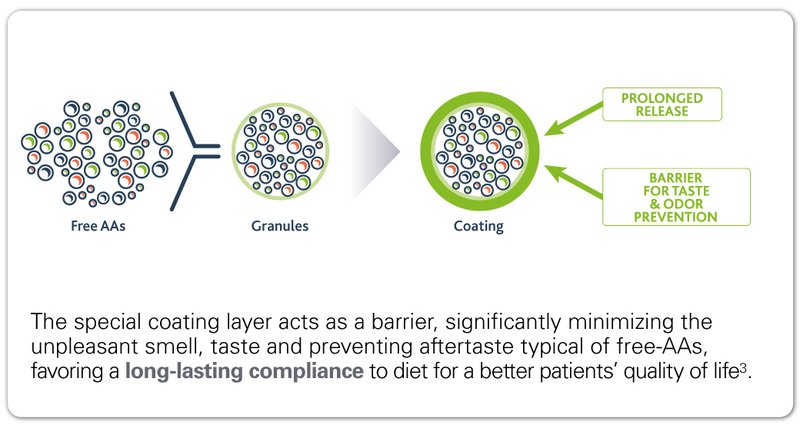 Our innovative and patented application of this technology allows us to obtain a revolutionary formulation of AAs in coated micro granules to support a prolonged release, similar to intact natural proteins. 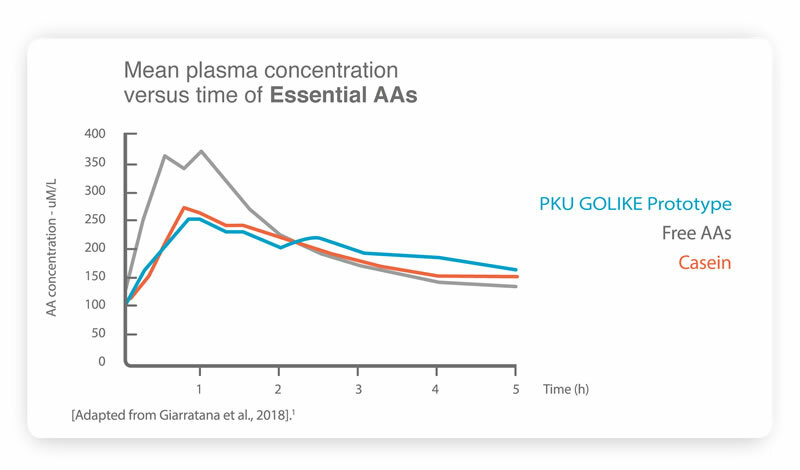 Mimicking a physiological absorption of amino acids leads to a more efficient AA utilization, and contributes to a better metabolic control in PKU patients1,2. In the same way, the technology provides a remarkable masking of the unpleasant odor, taste while preventing aftertaste, typical of free AA formulations. An improved palatability increases acceptance and supports an enhanced compliance to the treatment, therefore, contributing to a better nutritional management3. 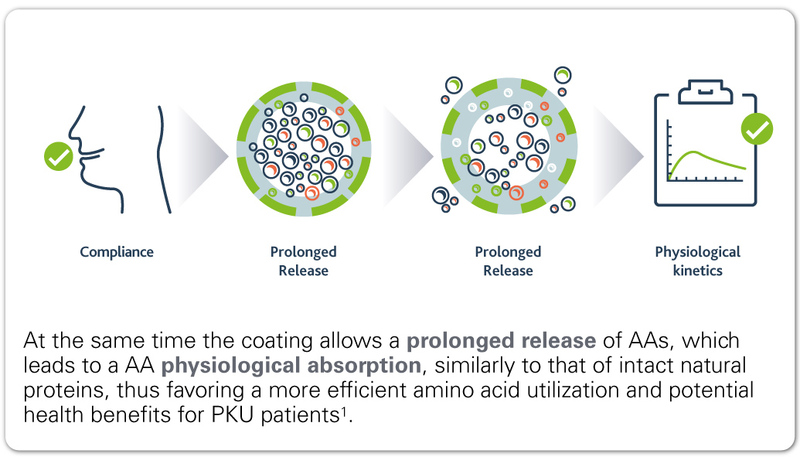 PKU GOLIKE required an extensive pharma-like development process to obtain such an innovative product and to offer PKU patients a new treatment choice to reduce the daily burden of their disorder both at metabolic and organoleptic level. 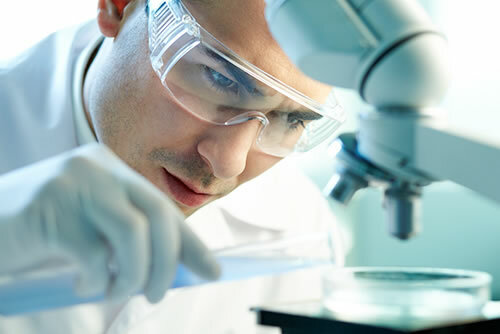 This development process included various stages going through chemical and formulation research as well as In Vitro and In Vivo experimentation. - Optimized dissolution profile of the amino acids starting from various formulation and engineered prototypes. 1. Kinetics: Absorption of AAs with Physiomimic™ Technology4. - Physiological absorption of AA similar to that of intact natural proteins (casein), and significantly different from free AAs. 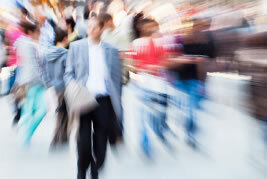 - Blood Urea Nitrogen (BUN) reduction, thus more optimized utilization of Nitrogen. 2. Metabolic parameters: How AAs with Physiomimic™ Technology are used by organism5. - The AAs with the Physiomimic™ Technology may modulate BUN and glycemia in the same direction of dietary proteins. - Better AA utilization pattern with the application of the Physiomimic™ Technology. MacDonald A., Singh R.H., Rocha J.C. and Van Spronsen J. Optimising amino acid absorption: essential to improve nitrogen balance and metabolic control in phenylketonuria. 2018. Nutrition Research Reviews 1-9. Van Wegberg et al. The complete European guidelines on phenylketonuria: diagnosis and treatment. 2017. Orphanet Journal of Rare Diseases 12:162. MacDonald A et al. Adherence Issues in Inherited Metabolic Disorders Treated by Low Natural Protein Diets. 2012. Annals of Nutrition and Metabolism 61:289. Giarratana et al. A new Phe-Free protein substitute engineered to allow a physiological absorption of free amino acids for phenylketonuria. 2018. Journal of Inborn Errors of Metabolism & Screening 6: 1-9. Rocha J C et al. Preliminary indications of metabolic modulation by provision of amino acids engineered to allow physiological absorption. 2018. J. Inherit Metab. Dis. 41 (suppl. 1): S105-S106. SSIEM 2018, Conference Proceedings.